I'm late! I'm late! I'm late to the salted egg yolks party, but it's a trend that I believe will never go out of style because it is numero uno on the yumness scale! Therefore, any time is a good time to jump on the bandwagon. 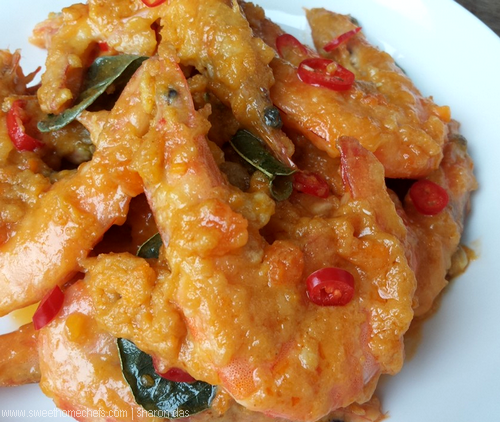 'Sap Ham Dan Har' (Wet Salted Egg Prawns) is a dish hubs and I regularly order at a Chinese restaurant nearby for visiting friends and relatives to try because it puts the oohs and aahs around the dinner table. It has always been on my mind to cook this. However, nothing materialised until I decided to make my own salted duck eggs a month back. When the eggs were ready, I started searching for recipes to use it up. 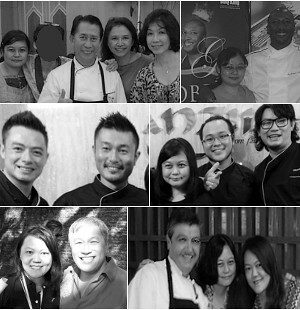 A little googling brought me to Lia's Food Journey blog. It looked closest to the dish I wanted to recreate. I made a couple of changes to suit my palate, of course. 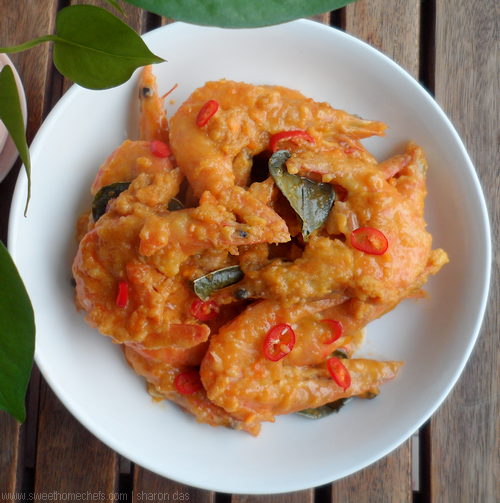 The result is this dreamy salty-sweetish prawn dish that had us licking the plate clean! 1) Dip prawns in beaten egg, then coat with corn flour. Pan-fry in cooking oil until just done. Remove prawns from pan. 2) Leave about 1 tbsp of the cooking oil in the same pan (spoon out excess). Add butter and garlic. Saute until the butter is melted. 3) Add kaffir lime leaves and the mashed egg yolks. Stir to combine. 4) Then, add evaporated milk and sugar (to taste). Stir until creamy. The sauce is done. Lower the heat or switch it off. 5) Add the prawns back into the pan along with slices of red chilli. Stir until the prawns are all coated with the sauce. 1) The ingredients. 2) Dip prawns in egg and coat with corn flour. 3) Pan-fry the prawns. 4) Heat butter, saute garlic in pan for the sauce. 5) Add mashed salted eggs and kaffir lime leaves. 6) Stir quickly. 7) Add evaporated milk. 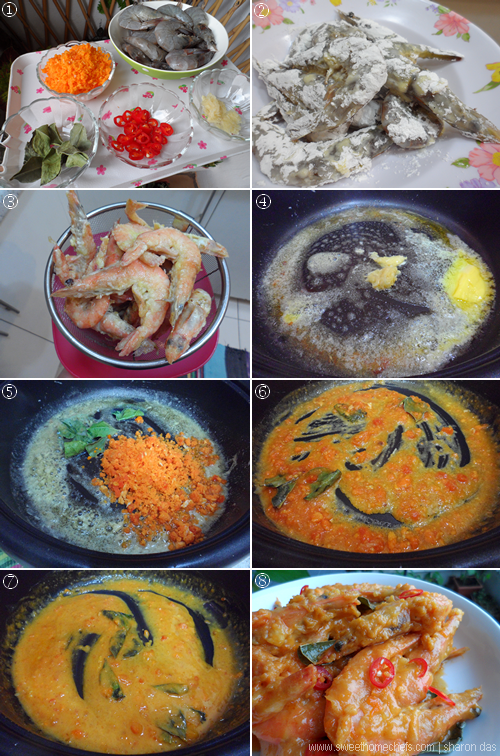 8) Finally, mix the prawns together. There you go. Best eaten with rice! I miss the salted egg yolk dishes. These prawns look droolicious, Sharon. It's the yummiest thing, Angie. Thank you! Looks so yummy! I am drooling looking at the prawns! I went looking for jumbo prawns last weekend but couldn't find any. Would love to have baked some with cheese! Thanks, Natalia. We're crazy for stuff with salted egg yolks. The best thing ever! I watched it the whole time - it sure cooked quickly ..haha! I love salted egg yolks, but never had a dish like this...looks delicious Sharon...I will have to give this a try. Wow, this looks absolutely delicious, Sharon! Not a dish I have tried before...the sauce! Love the idea!! Yes ..the sauce! It was love at first taste for me so I knew I had to cook it for myself one day. Finally did! I have never tried salted eggs but the dish looks yummy. Hi Sharon, this dish is so tempting ... a 'die die' must eat dish ... love the creamy salted egg yolk sauce! look so yummy, I am hungry now.